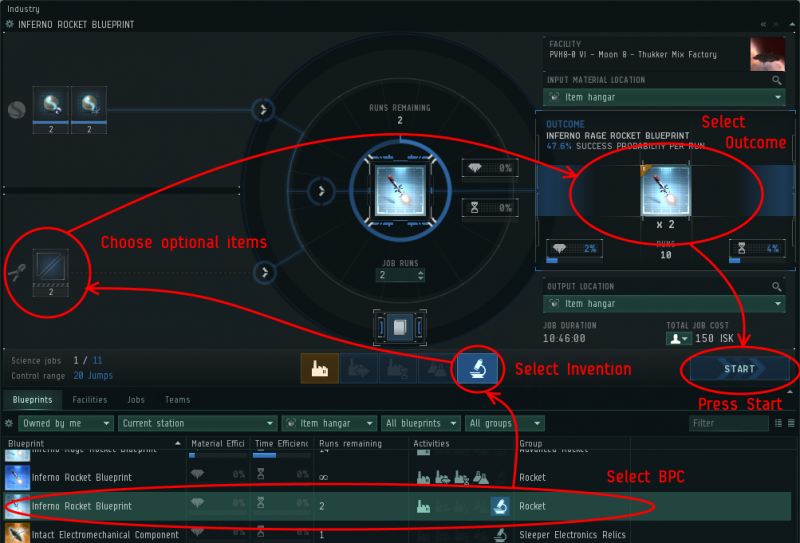 Invention is the means by which you produce blueprint copies for Tech 2 items and ships in EVE, which can then be sold on the market, or (more popularly) be used to manufacture those items for sale or personal use in the game. A player using the invention process takes a blueprint copy (BPC) for a Tech 1 item, adds certain specialized equipment, and attempts to create a BPC for a corresponding Tech 2 item. Although it sounds simple, invention can be very expensive and difficult to do successfully. The (hopefully) created BPC will have a single run on a ship BPC, and 10 runs on everything else. It will have ME -2% and TE -4%. These values are regardless of those on the input T1 BPC. The Runs, ME and TE levels on the created BPC can be adjusted using decryptors (see optional items below). For a quick history of Tech II manufacturing, see the section at the bottom of this page. There are four racial and one Sleeper encryption methods skills. Each T2 item is associated with one of racial encryption methods, while Sleeper one is required for inventing T3 hulls and subsystems. An inventor must have the proper encryption method skill and the two science skills trained, as required for each item, in order to start an Invention job. Higher skill levels of the encryption methods and science skills lead to a better chance of invention. 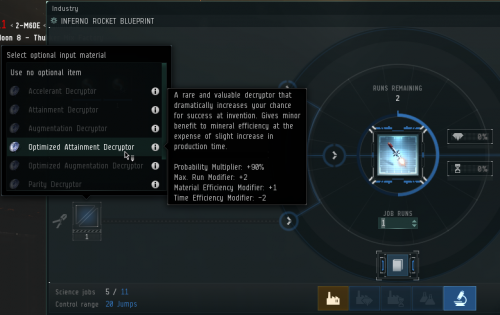 In order to see which skills are required, look in the Invention tab in a blueprint for any Tech I item. You should train the encryption method skills to at least level 3, and the science skills at least to level 4, to have a good chance of invention success. Laboratory Operation and Advanced Laboratory Operation will govern how many concurrent science jobs you can perform. Scientific Networking will govern from how many jumps away you can start science jobs. They are used exclusively in the manufacture of storyline modules, which are obtainable as BPCs from COSMOS missions. Note that the Sleeper Technology skill, despite its name, is not used for T3 production - you want Sleeper Encryption Methods (4x) for T3 production. There are 3 mandatory items and 1 optional item needed for invention. To find out which items are required, look in the Invention tab in a blueprint for any Tech I item, or load the blueprint into the Industry window and choose Invention. You must have a T1 blueprint copy (BPC) of the T2 item you wish to create. Whether the invention job is successful or not, this BPC will be returned to you with one fewer runs remaining on it. If it only has one run remaining, it will be consumed. The ME, TE and Runs Remaining on the input BPC are irrelevant. Not all items have T2 versions. To check this, open the Information window for a T1 item and look at the "Variations" tab. If a T2 version is shown there, then a T1 BPC for that item can be used to create a T2 BPC. Each invention job will require two types of datacores. The number of datacores needed depends on the size of the object created. Small modules only require one datacore of each type while battleships require 32 of each type. Datacores are primarily obtained through Factional Warfare loyalty point stores. They can also be 'farmed' from Research agents, although much less effectively, whilst some datacores can be found in exploration sites. However obtained, they tend to end up on the market, in the Manufacture & Research > Research Equipment > Datacores tab. Whether the invention job is successful or not, these datacores will be consumed. Decryptors are an optional item that can be added to the invention process. Decryptors affect the invention chance of the process as well as the material efficiency, time efficiency, and number of runs of the created T2 BPC. Decryptors will be consumed during the Invention process, successful or not. Add the values from the decryptor to the base values to calculate the final outcome of the T2 BPC. Gather your BPC, all mandatory items and any optional items you desire to use in a station, citadel, or engineering complex with invention facilities. Engineering complexes provide significant innate reductions (from 15% to 30% depending on complex size) to job duration and installation cost, and further reductions in time and cost are possible if the complex owner has installed the appropriate rigs. Select the relevant BPC in the Industry window, and choose Invention on the activity list. The resulting window will tell you your invention chance, taking into account your skills and any selected optional items. The optional items can be selected using the boxes on the left hand side of the Industry UI. All possible items will be listed, but items not available for use (i.e. not found in the input material location) will be faded out. You can use the decryptor selection box to look at how each different decryptor affects invention chance and outcome. Be sure to select the correct Outcome, because some T1 BPCs can invent more than one T2 item (for example, a Scourge Rocket BPC invents both the Scourge Rage Rocket and Scourge Javelin Rocket BPCs, two different types of T2 rocket ammunition). Once the job is complete and delivered, you do not receive any explicit notification if your job was successful. The only indication of success is that the 'Outcome' box in the Industry window actually contains your T2 BPC and an animated blue highlight - you will be able to find your new T2 BPO in the list of blueprints. If your invention failed however, the 'Outcome' box in the industry window will tint red, with an animated red bar across, and display a large Job failed text in red. You can also see a summary of the success or failure of each job in the job listing after delivery. Either way, your datacores and optional decryptor will be consumed, and your BPC will be returned with one fewer run on it (unless it only had 1 run remaining). Tech 2 blueprint copies have 10 runs, +2% ME and +4% TE, unless modified by a decryptor. T2 BPCs for ships and rigs have 1 run (again unless modified by a decryptor). The only activity you can do with a T2 BPC is to manufacture it, you cannot research or copy it. It's not difficult to get a good chance of success for modules, but progressively more difficult for ships as their size increases. This is why investing in some decryptors is a good idea for Tech II ship invention jobs. Here's a very basic invention chance calculator created in Google Sheets - http://www.eveuni.org/invention. Let's say we are inventing from the Inferno Rocket Blueprint in the earlier image - so select Modules, drones, rigs, ammo, intact Ancient Relics in the first box. The probability of success is 45.6%, exactly what we see in-game. You can find a much fancier success chance here http://games.chruker.dk/eve_online/invention_chance.php, and another chance & profit calculator here: http://eve-industry.org. You can experiment with different skill levels and decryptors to see how the probability changes. Use this to determine the levels of skills you wish to train, and whether you want to invest in decryptors. Remember that decryptors also affect max runs, ME and TE of the final BPC, not just the chance of success. Science skills each improve the chance of success by more than the encryption skill, so since all are 5x rank skills, you should train science skills up first. A decent option is to initially train encryption to 3 and science skills to 4. Eventually you should consider training encryption to 4 and the science skills to level 5 - especially the ones for ships - if you are going to be producing significant amounts of certain items. Decryptors can virtually guarantee success, but can also be very expensive: in general, use the expensive ones only for big items like Tech II ships. 'Symmetry' and 'Augmentation' type decryptors are often cheap, and add +2 or +9 (the latter at the cost of a lower invention chance) runs to the resulting BPC, so they can be very worthwhile (especially for ships and rigs, which only give 1-run BPCs by default) in driving down invention costs per manufacturing run, as well as increasing T2 manufacturing throughput by loosening the invention bottleneck. To maximize profits from invention, you need to minimize your investment costs. This means using buy orders to purchase invention items in the market: datacores & decryptors. You'll also want to shop around to different systems to find the most affordable blueprint copying and invention facilities. As you gain more experience in invention, you can experiment with different investments in your mix of skills and decryptors. If you are going to be a serious producer of Tech II items, you will eventually want to establish, or secure access to, an engineering complex - with significant time saving bonuses - for copying and invention jobs. Once upon a time, CCP decided that Tech II items and ships would be a cool thing to offer to EVE players. This, however, presented a problem. To maintain balance, T2 items had to be more expensive and harder to get than T1 items, since they represent a significant improvement in performance. They couldn't simply seed T2 BPOs in stations, as T1 BPOs are provided, or else no one would ever make T1 items anymore. And so, in their infinite wisdom, CCP created the T2 BPO lottery, where a limited number of T2 blueprint originals were awarded to players, based on the number of research datacores they owned. This happened with the Castor expansion in 2003. This solution, naturally, presented some new problems. The production of T2 items was reserved to a relatively small number of experienced EVE players who were lucky enough to get one of the BPOs. This allowed them to control the prices completely, making T2 items dreadfully expensive. Also, there were rumors abound that CCP was rigging the lottery to favor certain players or corporations, making it unfair. So, in their now smarter infinite wisdom, CCP developed the invention process with the Revelations expansion in 2006, which allows any EVE player to produce T2 blueprint copies, after a significant investment in skills, materials, and equipment. The invention process produces limited-run T2 BPCs, but with a chance of failure, thus making T2 item production more difficult, but still attractive enough to warrant investment by players. Since BPCs produce limited runs of items, unlike BPOs, the invention process also keeps T2 item production at a much more intensive but more limited level than T1 production. T2 BPOs still exist in EVE, and are highly prized and hideously expensive. Their owners have gotten very rich in the game, and they guard their use very diligently. Many have speculated - and CCP has actually suggested - that T2 BPOs may one day be discontinued. If this ever happens, not only will it make a lot of people very angry, and a lot of other people very happy, but the invention process will be the sole source of advanced tech items in the game. This page was last modified on 16 July 2018, at 10:26. This page has been accessed 139,535 times.